There is a new closed source Ethereum (ETH) miner that also works with other Ethash-based crypto coins available and it is called Eminer. The miner is available for both AMD and Nvidia GPUs and what makes it really interesting is the integrated local web dashboard that gives you detailed stats for the mining rig the miner is running on. 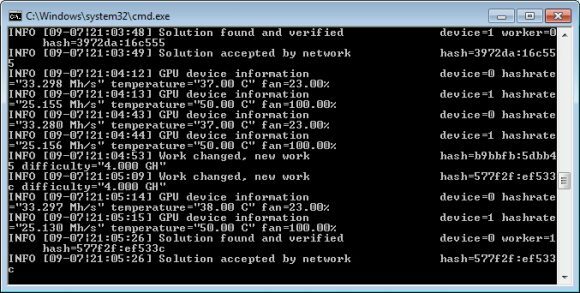 The new Eminer ethash miner v0.6.0-RC1 is written in the Go language and provides performance comparable to that of other top miners for AMD at least with possibly slightly slower hashrate on Nvidia. Eminer comes with support for Stratum and RPC clients with failover, as well as with support for Nicehash’s stratum implementation. There is however a 1% devfee included in this miner software, so have that in mind should you decide to give it a try. The Windows version comes with Asynchronous multiworker mode that searched shares with multiple instances and this can supposedly bring increased by 1% ~ 2% share luck. Binaries for Linux and Mac OS X of the miner are also available. The real gem here is the web-based interface that gives you an overview of the mining hardware and the current mining process, including a graphical representation of the hashrate over time. YOu get information on the available AMD or Nvidia GPUs and their current status such as clocks, hashrate, temperature and fan speed. 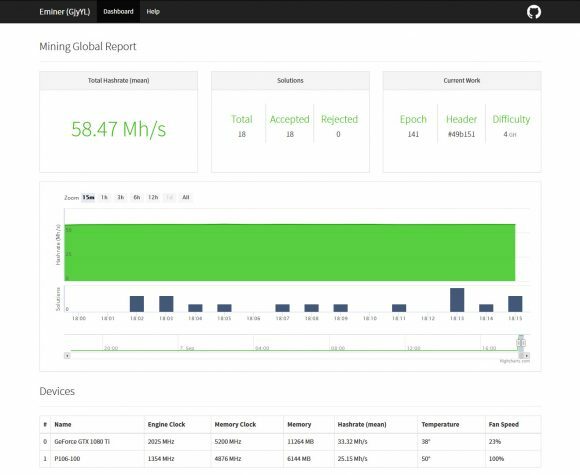 This allows for quick and easy overview over web of multiple mining rigs without having to spend time decoding the console output from the miner… that one can use some improvements to be more useful, but probably the focus was placed more on the web-based dashboard. Still this new miner looks promising and useful and it never hurts to have some competition among the crypto mining software. Since it is a closed software with no source available posted by a new user on Bitcointalk some people might have some concerns you can check a VirusTotal scan of the executable here. Not a guarantee that there are no warnings since it is a new miner that is not based on other existing codebase that gets detected as potential threat by some antivirus software.